Welcome to Camping Les Méditerranées Beach Garden! Situated in the Languedoc province along the sparkling south coast of France, a warm welcome awaits you and your family at Les Méditerranées Beach Garden. Stay in one of LUX-camp’s high quality mobile homes and experience everything this luxury camping site has to offer, as well as the wealth of delights begging to be explored in the fabulous surrounding area. So what are you waiting for? Just jump in and enjoy! Camping Les Méditerranées Beach Garden! What’s on at Le Beach Garden? Why Should I Stay at Le Beach Garden? Le Beach Garden doesn’t fail to deliver when hunger strikes. 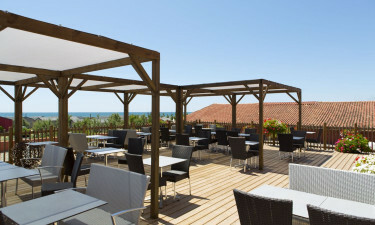 Enjoy a tasty snack al fresco at the beach café or for the more demanding appetite why not treat yourself to a sumptuous meal at the site’s luxurious restaurant with its fine food and ocean views to enhance your dining experience? 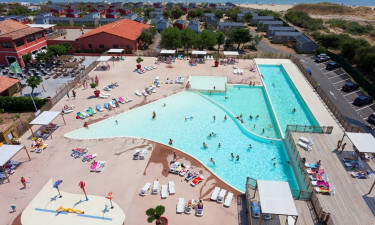 Although there are many delightful shops in nearby Marseillan and Adge, those staying at this luxury holiday campsite have no need to leave its boundaries to shop when the need arises. Le Beach Garden boasts a supermarket for those groceries and essentials every family needs on holiday and there is The Bazaar, where the avid shopper can track down those all-important souvenirs and take-home presents! Your holiday is important, so let LUX-camp at Le Beach Garden make your camping holiday an incredible one.